1. Golden-Bronze Female Tusken mask: ( suggested to have some green tint to give it a weathered copper look). The forehead portion has 3 “jewels”, there’s a wire mesh visor, 4 divots in the nose/cheek area. The“bib” has 9 chinks each with an oval in the center and one long piece at the bottom, 5 bones in the center, a half circle at the end of the bones. 2. Layered Shawl/Burka – Weathered Tan/Sand Monk material (or similar) lighter than the dress. The shawl length should end below the knees and be somewhat formfitting. 3. Dress/Inner Robe: Lighter weight Monk material (similar to shawl) Full skirted, Dress can be short sleeved or long sleeved (see note on arm wraps). Must be weathered, especially at the bottom. 4. Weathered, Tan/mustard colored cotton or leather gloves . NO satin or velvet. 5. Weathered bronze color tribal design bracelets. 6. Gauze or muslin Arm wraps, wrapped up to the elbow. If dress is short-sleeved , there must be no visible skin..
8. Sturdy leather or leather like material bag/purse. Rectangle or long “half” oval shape with a half circle bone or bone like clasp in the front. 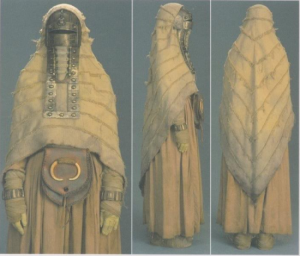 Gaderffii (gaffi stick)- of similar design to the styles used in Episode 2 and Episode 4.